The TriCore Orthopedic Cervical Neck Pillow is an effective neck pillow for support all around. This neck pillow has a trapezoid- shaped center perfect for aligning your head and neck in the proper posture for optimal alignment. It features two different sized lobes to provide you a better fit for comfort. The TriCore Family of Neck Pillows is designed to help eliminate symptoms by treating the cause of your neck pain. They are also designed to ensure continued health of the cervical spine by allowing you to maintain proper posture. 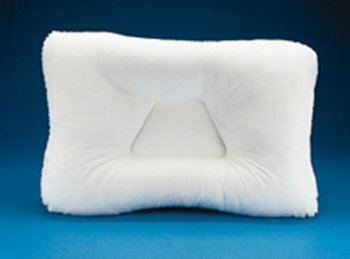 If you are waking up with a stiff or achy neck, then try the TriCore Orthopedic Cervical Neck Pillow. Designed with comfort in mind, it has many features that make this one of our more popular Support Pillows. Helps to alleviate head and neck pain…even snoring.